Hardware kit in a nice plastic container. Pump adapter for installing all popular pumps to the case. 8 Pin EPS (CPU Power) cable extension. The interior layout of the case allows the motherboard to be installed on one side, and the GPU on the other side. The upper chamber is designed to hold all your hardware (motherboard, and GPU), the lower chamber on the Shift X allows for custom water cooling setup. The case can hold up to a 280mm radiator in the lower section. Even though it’s not mentioned, but you can install a 120mm radiator in the bottom of the case as well. The back of the case has a place for mounting a couple SSDs. The case also features a nice PSU shroud that will work with SFX PSUs. You can use an ATX PSU (up to 160mm long), but you will not be able to use the PSU shroud with those. If you plan on using the case laying on its side the area right above the PSU shroud can be used to mount the pump for your custom loop. The motherboard side of the case has a flip down cable routing shroud. Magnets on each side keep the shroud in position and allow for complete access to your cables. The case also comes with a PCIe riser cable to allow for mounting the GPU to the included GPU bracket. With the cover flipped down, you can easily access the cable routing grommets and tie downs in the front. You can also access the GPU bracket thumb screw with the cable routing cover down. The design of the case allows you to slide the GPU across the case as desired for better airflow or aesthetics. The GPU bracket has two (2) screws that hold it on the GPU side, and a thumb screw on the motherboard side. You can take the GPU bracket along with the PCIe rider cable out once the two (2) screws and the thumb screw has been removed. Phanteks ships the case with the GPU bracket set for having the front of the GPU face the inside of the case to allow for better air cooling. If you are going to be water-cooling your GPU it is recommended that you flip the GPU bracket to allow you to showcase the GPU block. To flip the GPU bracket around, you need to remove the two (2) screws on the GPU side, and the thumb screw on the motherboard side. Once that is done, you can remove the thumb screw stand off (circled in red above) and move it o the opposite end of the GPU bracket. The PCIe riser cable that is included with the case feels like a really great quality cable and has added support at the edges to make sure that there is no damage due to tight bends in the cable. Time to get the front and the back aluminum panels removed from the case. The case comes with two (2) 140mm fans, there is one mounted on the top and the second one is mounted in the bottom. The case is setup to draw air from the bottom and exhaust it out the top ( the way it should be). The front of the case has space for you to mount a 280mm radiator with a max thickness of 60mm depending on the GPU. I used a 35mm thick radiator to avoid having any clearance issues with the GPU and still have plenty of space to mount my pump+reservoir on the radiator fan. If you plan on not mounting any radiators in the front of the case, you can use that space to mount a couple 3.5″ hard drives if you choose to do so. 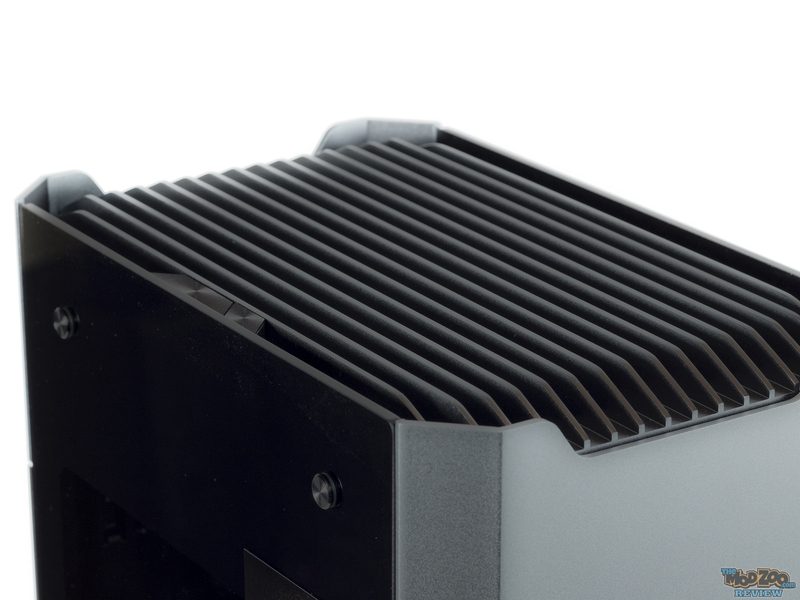 The back of the case has a wide opening for the PSU fan and ample room for you to route your cables through the PSU. The case also comes with two (2) SSD mounts that are pre-installed in the back (there is support for four (4) SSDs in total). The case also has some nice Phanteks Velcro cable ties on the back to allow you to keep your cables in check. The bottom of the case has a slide out dust filter for easy cleaning. All the vents on the Shift-X are filtered making sure that the inside of your case is as clean as possible. The bottom panel of the case can be removed by just pulling it off. This is necessary in order for you to install the PSU and/or access the bottom fan. The black feet can be removed by taking off the screws from the bottom panel to allow the case to be used laying flat. In order to install a PSU, the PSU shroud must be removed. The PSU shroud is held in place with two (2) thumb screws and just slides up and out once the thumb screws have been removed from the back. The PSU shroud has a cable routing grommet on the top to allow for you to pass any cables if needed. Based on my build experience, there is enough room in the back for you to route almost all cables that might be needed in the build. The rear bottom of the case also features a couple USB 3.0 ports, the only IO options the case comes with. Given the fact that you can easily access all your board IO options from the top, Phanteks decided to not include any audio connectors on the case. The SSD mount on the back of the case can be removed to allow you the room for tubing and fittings if you are going to water cool your GPU. With the cover removed, there is ample room not just for the fittings, but also makes it very easy to work on the loop as your hands are not cramped against a case panel. The back panel of the case has removable filters on the side that can be easily taken out for cleaning. The design of the back panel also allows all your cables to be tucked away and the panel to slide over them. The filters are held in by a couple clips on each side of the panel and are very easily removed. The front panel is very similar in design with a little big difference. The front panel conceals a divider that separates the air flow of the top chamber from the air flow for the bottom chamber. Why do this? The case can pull air from the bottom and vent it out the top using the same set of vents and not have any overlap.